Ekal Chapter of Washington DC successfully organized and conducted its annual event of Great Teacher Lecture Series on December 10, 2006 at Siva Vishnu Temple, Lanham, MD. The topic for the event was "Empowerment Through Education". The guest of honor was Immaculee Ilibagiza. Ms. Ilibagiza was born and raised in the village of Mataba in Rwanda, a nation located in the south eastern part of Africa. She grew to become a student of Electronic and Mechanical Engineering at the National University of Rwanda. In the spring of 1994, the death of Rwanda's Hutu president sparked a three-month slaughter of nearly one million ethnic Tutsis. 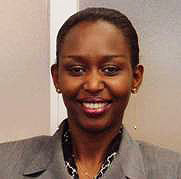 Four years after the Rwandan tragedy, Immaculee immigrated to the United States and became a member of the United Nations Development Program. Currently, she lives in Long Island with her husband and children. Ms. Ilibagiza related to her audience, the challenges she had to overcome and the doubt and fear she suffered before becoming the confident individual she is today, an author of a New York Times bestseller "Left to Tell" documenting her experience during the genocide, and the founder of the "Left to Tell Charitable fund" which provides education for Rwandan orphans. Ekal Vidyalaya saw in Ms. Ilibagiza the same goal it holds for itself, providing education for all children as a means to empower the individual. Over 3 days of warm discussion, engrossing debate and beautiful cultural programs the participants enthusiastically lived the theme and emerged charged and motivated with ideas and directives to make it an integral part of the Ekal movement. In this regard, the importance of the Anchal Samanvay samitis and the crucial role they play in interlinking the villages and cities was emphasized. Indeed, in this context, nine Anchal samitis were honored for meeting their swavlamban targets! It was also a homecoming of sorts, as it was from Kolkata that the Ekal movement started, and all participants were warmly welcomed by the very active and inspiring Kolkata team. Kolkata also has a very strong Mahila team and as usual, this spearheaded the events and together the Kolkata teams organized a truly memorable Samanvay Varg. 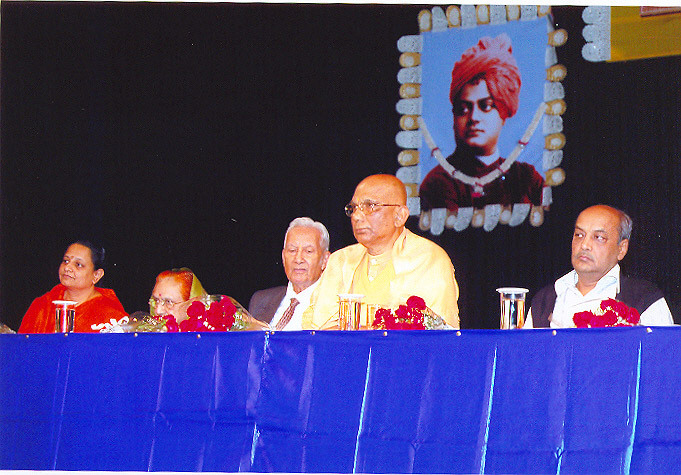 Imminent industrialist Shri SK Birla, accompanied by his wife Sarla Birla, were the chief guests for the function. They were joined by Swami Jitatmanandaji, from Chinmaya Mission. 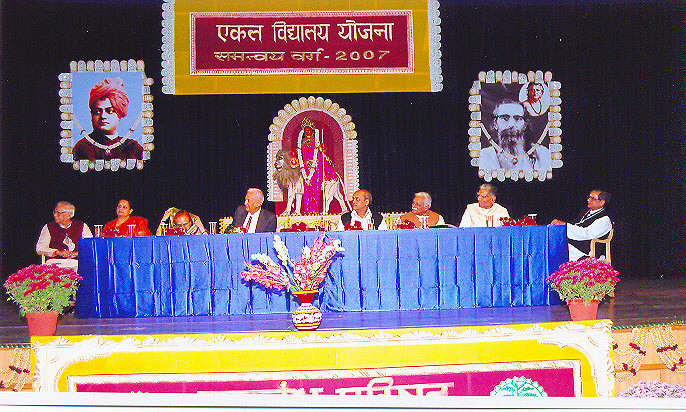 The inaugural Ekal Global Learning program was organised from 1st Jan to 8th Jan 2007 in Jharkahand tribal areas, the oldest field of Ekal working. Around 11 office-bearers from Ekal chapters in Bharat and abroad participated in the program, conceptualized and devised to provide a practical hands-on exposure to Ekal working to complement the theoretical knowledge of the Ekal system. The participants were taken through a tour of various projects in Jharkhand including Birsa Seva Gram in Karanjo, Vikas Bharti Bishunpur, Ekal schools in Netarhat as well as Basic Management Training Centre and Prasikshan Vidyalaya in Ranchi where they could understand the practicalities and ground realities of the grassroot working which forms the backbone of the Ekal system. The visitors were most impressed by their experiences. To highlight a few - The Chatra Swavlamban Yojana in Karanjo whereby children are provided with theoretical education up to Class X and XII as well as vocational training in areas like carpentry, food preservation, cultivation and agricultural training, vermin compost and crafts. Each student has his/her own individual Bank Account in which they deposit their earnings while continuing with their learning, enthralled the visitors. Quote Dr. Lakhra " I am extremely pleased to see the dedication of our grass root work force and the strong organization network at ground level. We in USA can not imagine the volume and unagnarimity of enormous work being done in India unless we see ourselves and get first hand information of the ground work. The Karanjo Project must be replicated in every state by several units...". The Jatra Bhagat Statue in Chingri village served as an eye-opener through which the participants learnt tribal history and the tribal's strong resistance to British rule. During the tour to Bishunpur, the participants had the opportunity to be a part of the annual Khelkood Pratiyogita of Ekal children and witness the enthusiasm of the children, their parents and entire villages. The interaction with Shri Ashok Bhagat, Founder and Gen. Sec of Vikas Bharti was enlightening and inspiring. 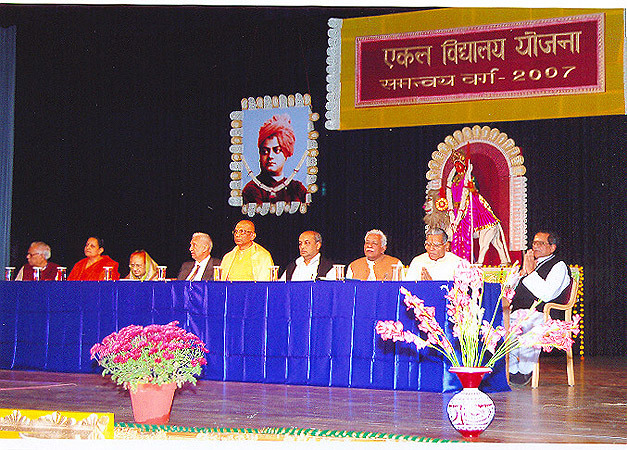 Shri Bhagat told the gathering "We do not work for society (rural/tribal). We work in the society with society. The ultimate goal of real social work to make society capable of serving their selves." During the visit to Netarhat participants experienced first hand how Ekal Vidyalayas are running in these remote and inaccessible regions and how our Ekal movement is working in this difficult and hilly terrain with minimal irrigation facilities to alleviate poverty through its Gram Vikas projects. Through the visit to BMTC and Prasikshan Vidyalaya the visitors understood the deep focus Ekal movement places on Karyakarta training through basic management training as well as refresher courses and other workshops. Hence, in a short period of eight days the participants were exposed to nearly all the differents schemes of Ekal movement, its system, its management, meetings, Workshops, integrated projects etc. Dr. Yashpal Lakra, President EVFUSA, was deeply moved by his experiences during the EGL program. The dedication of the karyakartas, the first hand exposure to the ground realities amongst which the Ekal system works impressed him. During his visit to his hometown of Ludhiana, he organized a meeting of prominent citizens where he shared the inspiring and memorable moments of his tour. Outlining the impact and tangible benefits of the Ekal Movement, he exhorted them to support and participate in the Ekal movement. After months of preparation and anticipation, we successfully participated in the Mumbai Marathon. The excitement in the air was palpable. Our visiting Karyakartas were moved by the spirit of Mumbai. It was the first time for Friends of Tribals Society. Approximately 320 people wearing FTS T-shirts with FTS flags participated. Everyone was charged with excitement at the show of strength of FTS. It was a good show, even though it was the first time for us and a new concept to understand. An interview was also taken on that day which was broadcast live and is being repeated even now. Ten Vanvasi children had come with Karyakartas to participate in the event and they won over Mumbai citizens with their courage, confidence, presentation and attitude. They had dressed as Ram, Sita, Laxman with their troupe and they won the first prize in the Fancy Dress Competition with a prize money of Rs. 25,000! The picture from the Times of India - Bombay Times is attached. 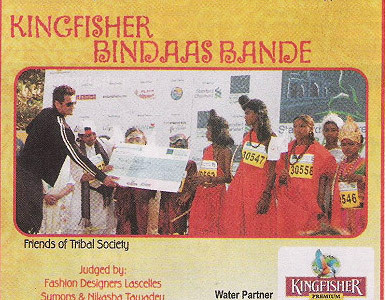 The publicity generated was tremendous and this proved to be good way of making the FTS brand famous. We should try to participate in the various marathons that are held in the other parts of the country also. Thanks to our sponsors --- SKF, RR Kabel, Edelweiss, Inox, Omega Investments & Properties, Gitanjali Diamonds, IL&FS and Lupin Ltd. Ofcourse, the event would not have been possible with out the efforts of Smt Chandralekha Roongta - Vice President FTS Mumbai and Shri Anil Kumar - Yojna Pramukh. 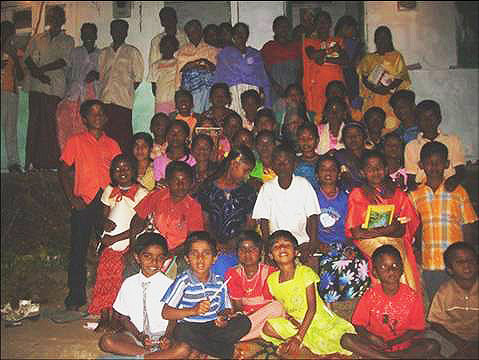 Shri Vinod Varapravan from Canada visited Vandiperiyar (near Thekkady) in Idukki district of Kerala on 5th January, 2007 with his family. 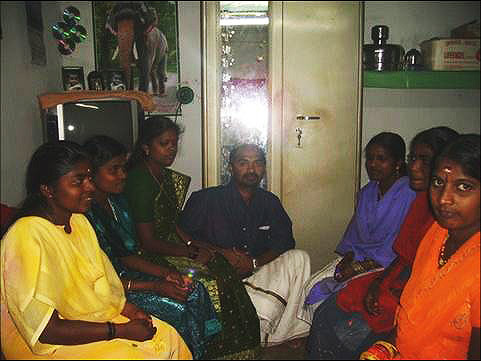 The visit included a three hour interaction with the students of Passumalai's Ekal Vidyalaya and their parents. Here are some of his experiences and insights, in his own words - "As a first-time donor, new to Ekal - this visit has left an indelible mark in my mind and sparked the desire to do more.........According to the town samiti, Ekal has helped enhance the performance levels of these children at the State Government school and these children are out-performing other children. 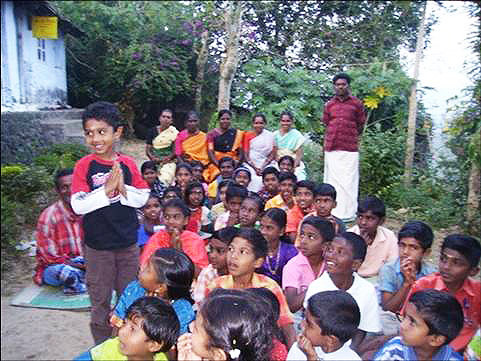 Well this must come as no surprise because this group of children turn up for Yoga classes at the Ekal Vidyalaya at 5:30 am...some determination and discipline, when temperatures in this high range area of Idukki in the morning does dip down to single digits." 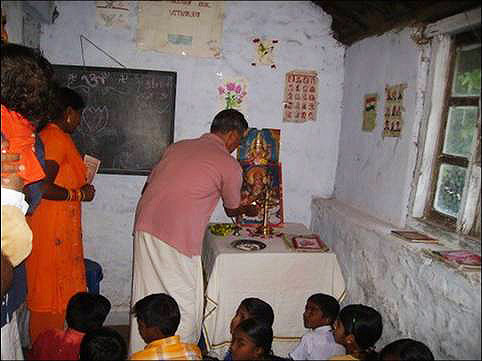 Shri Ramji from USA visited EkalVidyalaya in village Shiyali in Gujarat (near Narmada, Dediyapada) in December, 2006. Shri BP Jalan and Shri Sudhir Maggu, along with other office-bearers of the Raipur Chapter of FTS decided to share the auspicious occasion of Makar Sankranti with their tribal brethren. Hence, a truly memorable one day vanyatra on the 14th of January was organized with 21 prominent citizens from Raipur and Kanker Anchal participating. The group left Raipur at 6:30 am and reached Kanker at 9:30 am. The highlight of the vanyatra was the visit to Ekal Vidyalayas in villages Thema and Nisanharra. At Thema, the vanyatris were impressed by the intellectual prowess of the students as exhibited during the interaction and discussion with them and their teachers. The students, teachers and vanyatris participated in some interesting games organized by Shri Anil Daga, Vanyatra Prabhari. At the end of the interactive session, Shri BP Jalan honored the Gram Pramukh, Gram Mahila Pramukh, parents of the Ekal Vidyalaya Acharya and other prominent village citizens with shawls and gifts. Shri Jalan also distributed umbrellas and jerkins specially brought from Kolkata to the villagers, and Shri Maggu and Shri Chaggan Patel distributed blankets. After having lunch together, the vanyatris bade a warm farewell and traveled to the next stop. At the Ekal Vidyalaya in village Nisanhara they were warmly welcomed by the vanvasis with a performance of the traditional "Sua" dance. The warmth and joie de vi·vre was so infectious that the vanvasi dancers were joined by ladies in the vanyatri group! Once again, the students impressed the vanyatris with their knowledge levels and skills. The Vanyatris honored the prominent village citizens with shawls and gifts before leaving with treasured memories of a truly memorable Makar Sankranti celebration. 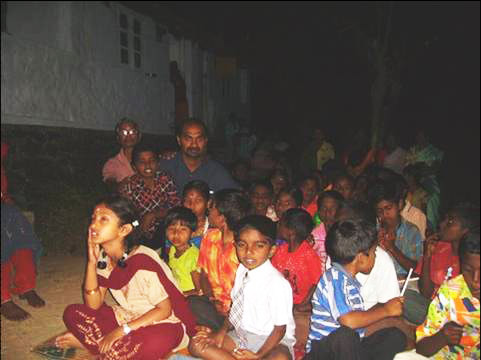 The Raipur chapter of FTS also organized another vanyatra to the villages of Nathukonha & Brahmanbahara on 24th January 2007. Around 22 prominent citizens from Raipur, Bhilai and Dhamtari participated in the Vanyatra where they interacted with the students of the Ekal Vidyalayas and their vanvasi brethren. Once again, leading the vanyatra from the front were Shri BP Jalan and Shri Chaggan Patel with their energy and enthusiasm! Ekal DC organizes "Path for Peace"
Ekal DC is searching for venues to present "Path For Peace", an exciting new dance drama on Mahatma Gandhi's life. We are soliciting your help, ideas and time. Please send your feedback and suggestions to ekal.washingtondc@gmail.com.